There might not be a Pixar film in theaters this year, but that doesn't mean the animation studio doesn't have something in store for fans. This Christmas, a new TV special is coming around Christmastime called Toy Story That Time Forgot. There will be a sneak preview of the ABC TV special at Comic-Con on Thursday, July 24th, and that's where you can get ahold of a cool poster designed by Hellboy creator Mike Mignola. That might seem like a weird match-up, but when you see the poster with a dinosaur warrior that has a mace in his hand, it'll all make sense. The Halloween short was fun, and this seems cool too. Look! During a post-Christmas play date, the Toy Story gang find themselves in uncharted territory when the coolest set of action figures ever turn out to be dangerously delusional. It’s all up to Trixie the triceratops (Kristen Schall), if the gang hopes to return to Bonnie’s room. 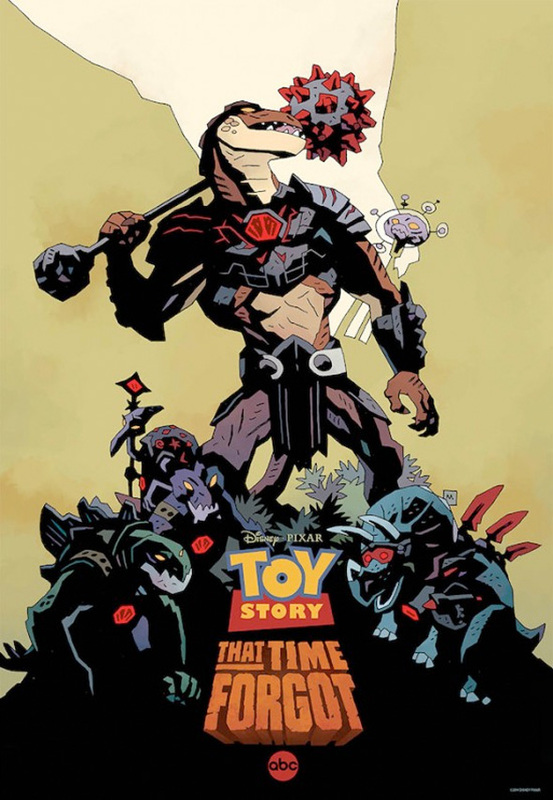 Steve Purcell (Brave) is directing Toy Story That Time Forgot, with Tom Hanks, Tim Allen, Wallace Shawn, Timothy Dalton, Don Rickles, and Joan Cusack all reprising their voice roles from the Ty Story franchise. The TV special is slated to air sometime around Christmas, but no specific airdate has been revealed yet. We'll keep you posted. Excited at all?